The Comic-Con & WonderCon Anaheim 2019 Press Application Period is Now Open! The press application period is now open and there are some exciting changes for 2019! The press application period now includes consideration for both Comic-Con and WonderCon Anaheim. Moving forward, there will only be ONE press application period for both conventions each year! The press application process is also now outlet-based, which means only ONE application per press outlet - instead of one application per individual press member. Each press outlet will be assigned its own Comic-Con Outlet ID and login credentials, managed by the outlet's Outlet Key Contact (OKC). Each press outlet's verification and "Press Outlet Application" status can be found in the Comic-Con Member ID of the OKC. Press status information is no longer displayed in the Member IDs of individual members of the press, unless/until they are registered for a press badge (for either convention) by the OKC at a later date. No action is required at this time for returning press outlets with a verification NOT DUE status. Once press badge registration opens for each convention, the OKC will then register the individual members of their press outlet. PLEASE NOTE: Individual members of an approved outlet must have their own confirmed Comic-Con Member ID to be registered for a press badge by the OKC. The WonderCon Anaheim 2019 press application period is coming soon! Please be sure to check back frequently for updates. We encourage you to follow us on Facebook, Twitter, Instagram, and Toucan - the official blog of Comic-Con and WonderCon Anaheim - for any important registation updates. 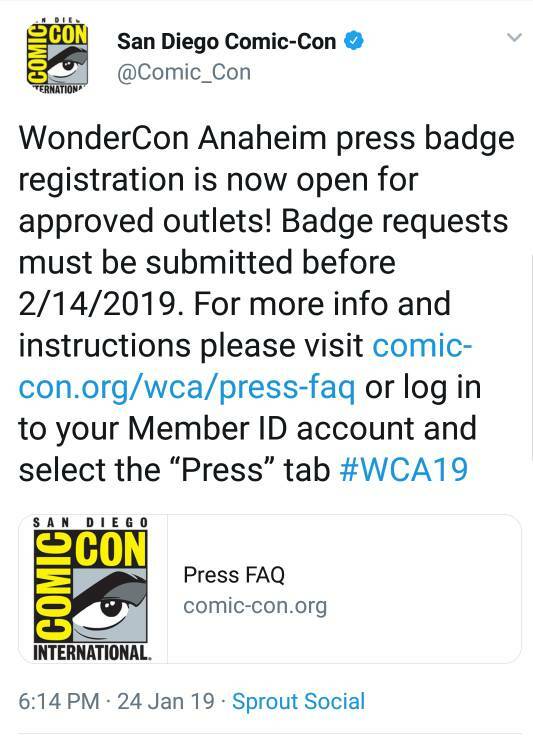 Members of the press that want to videotape, film, and/or record any matter that will be used for commercial purposes (non-news) must first obtain written permission from Comic-Con International/WonderCon Anaheim and any other participants being recorded. Live streaming at WonderCon Anaheim and/or posting more than 15 minutes of a panel is not permitted without prior consent from WonderCon Anaheim. To request the appropriate consents please email [email protected] with detailed information regarding the interest to record at WonderCon Anaheim. PLEASE NOTE: Names, outlets, titles, email addresses, and countries of registered press members will be made available to participating studios, exhibitors, programming participants, etc., prior to each convention (WONDERCON ANAHEIM PRESS LIST). As always, the issuance of a press badge is at the sole discretion of Comic-Con International/WonderCon Anaheim. Please be respectful to all attendees. A press badge is provided as a courtesy to cover our conventions. WonderCon Anaheim does not tolerate coverage that includes stunt type events, ambush interviewing or any sort of action that could make any attendee feel unsafe or uncomfortable. All registered members of the press are held to Comic-Con's Code of Conduct and all other convention policies. WonderCon Anaheim 2019 press badge registration is now open! To submit a badge request, the Outlet Key Contact should log in to their Comic-Con Member ID account, select the “Press” tab, and click the blue “Login to Outlet Portal” button. IMPORTANT NOTE: Each individual registered will be sent an email with instructions to complete their press badge request. Their press badge registration is NOT complete until they agree to the Press Terms and Conditions. Outlet Key Contacts should be sure to alert the members of their outlet that they will need to complete this process before February 14, 2019 to receive a badge. All press badge requests must be submitted prior to February 14, 2019. The registration system will close on this date.